The U.S. negotiator who worked on the original North American Free Trade Agreement says that despite U.S. President Donald Trump's suggestions, he will not likely terminate the deal anytime soon. In a campaign rally on Tuesday, in Phoenix, Ariz., Trump said he didn't think the U.S. could make a deal, and would end up "probably terminating NAFTA at some point, probably." Ambassador Carla Hills was George H.W. Bush's trade representative presiding over the initial talks in the early 90's. She told CBC News Network's Power & Politics she has been assured by people close to Trump that his threat was actually referring to a mechanism that could be enacted five years from now, after an assessment had been made into whether all three parties had met their commitments. "Let's hope that's what he intended," she told host Rosemary Barton. "It's a better interpretation than an ending of the agreement when our economies are so closely linked and we have so many jobs that are dependent." Litigation looming over softwood deal with U.S.
Hills says she would not have threatened to terminate the deal, and called on the president to be more diplomatic while negotiations are ongoing. "I would encourage him to use his diplomacy. He has demonstrated he has that capacity. And I think he will go further by using it," she said. Derek Burney, Canada's ambassador to the U.S. at the time of the first NAFTA negotiations, said the president's words will have little impact on Canada's negotiators. "It will be seen as what it is, a little flare of pro-wrestling in the middle of a serious trade negotiation," Burney said. Hills believes trade negotiations shouldn't be "hostile." The key, she says, is being able to listen and to understand the concerns of the other parties. 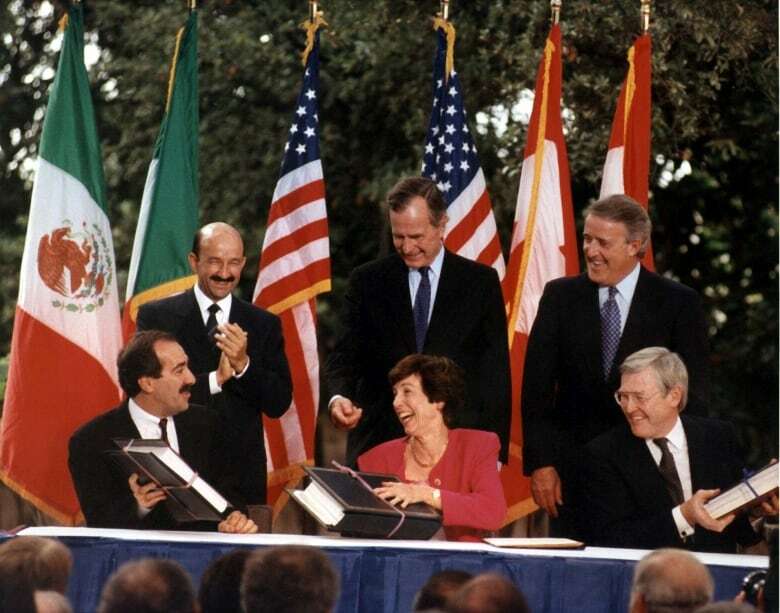 NAFTA 'a great advance' for U.S.
She also disputes the White House view of the historic agreement. Rather than being the "worst deal ever," she says it became the template for future U.S. trade negotiations and paved the way for the World Trade Organization. On the first day of talks, the current U.S. Trade Representative Robert Lighthizer said NAFTA had "fundamentally failed many, many Americans." He blamed the deal for the loss of "at least" 700,000 U.S. jobs. Hills, however, like many economists, believes jobs have been lost due to technological advancement and not NAFTA. "Today we have jobs that didn't exist then, and we have lost jobs that did exist then. And we need to train our workers for the 21st century, not for the last century," she said. "I do think that the agreement was a great advance." But Hills does agree with the Canadian government that the deal could stand to be modernized, particularly in the areas of digital trade and intellectual property. "It's kind of like an old house that you think is terrific. But it needs painting, and it needs painting probably every 25 years. And we're there now."